This vegetarian, middle-eastern inspired recipe is great as a side dish with roasted meats. Preheat the oven to 200°C, gas mark 6. Bring a large pan of water the boil. Add the parsnips, bring back to the boil and cook for 5 minutes. Drain and refresh under cold running water. Tip into a dry, clean tea towel and gently pat dry. Pour the oil into a large roasting tin and place in the oven for 5 minutes, until hot. Meanwhile, put the harissa into a large bowl and gently toss through the parsnips until coated. Tip into the hot oil and roast for 20-25 minutes, until crispy and golden. Place the yogurt in a small bowl, add the garlic and season generously. 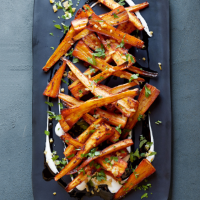 Put the parsnips onto a serving plate and drizzle the yogurt dressing over. Scatter over the preserved lemons and parsley to serve.